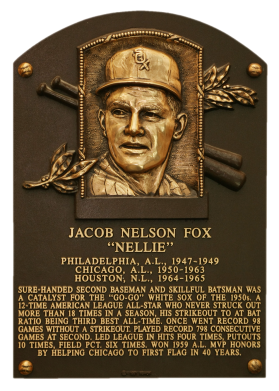 The man born Jacob Nelson Fox was a standout second baseman during a stellar 19-year career spent with three teams, but he earned the majority of his fame while playing on Chicago's South side. While not a power hitter, Fox's glove, speed and patience at the plate earned him 15 All-Star appearances and three Gold Gloves. 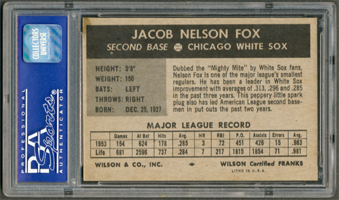 Fox struck out just once per 42.7 at-bats in his career, which ranks as the third-best ratio of all-time, and he led the league in hits four times and singles seven times. 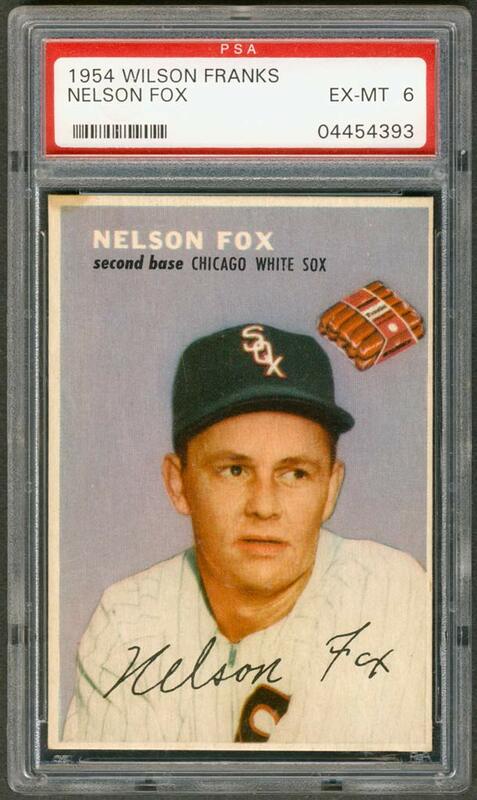 Comments: I remember my first Fox card for the collection was a 1961 Topps #30- the big wad of chew in his cheek cracked me up. The PSA 8 was purchased sometime in 2002. I decided to swap it out and picked up a 1954 Wilson Franks PSA 3 on eBay in November, 2006. 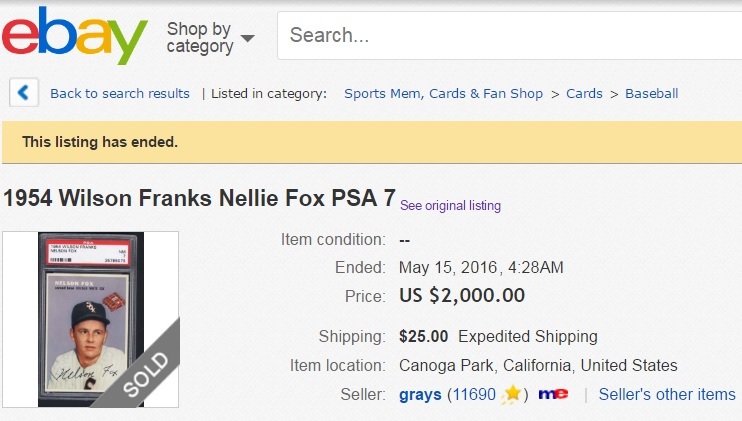 I upgraded to a PSA 6 with a purchase off eBay in September, 2012. Description: The 2-5/8" X 3-3/4" cards are among the most popular and difficult to find baseball card sets issued with hot dogs during the 1950s. The cards feature color-added photos on the front where the player's name, team and position appear at the top. The front also has a facsimile autograph and a color picture of a package of Wilson's frankfurters. 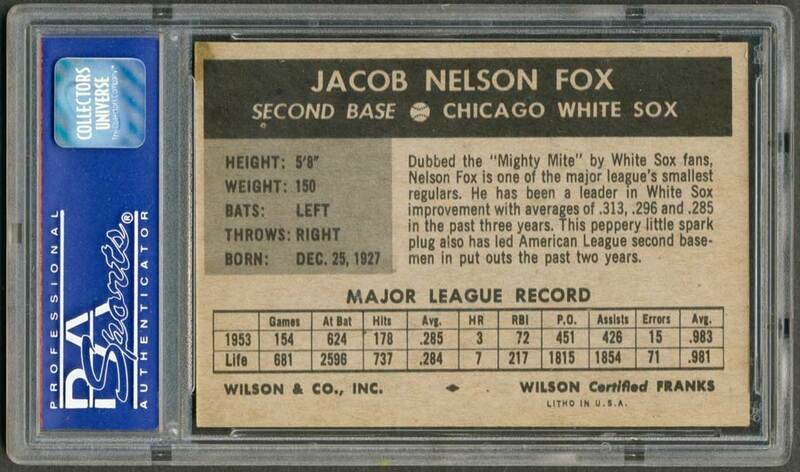 The card backs feature personal information, a short career summary and 1953 and career statistics. the 20-card set includes players from a number of teams and was distributed nationally in the frankfurter packages. The problem with such distribution is that the cards are very tough to find without crease stains from the hot dogs.